Just to prove that despite all the work on casualty bases, ADC's and other items for my current General D'Armee game on the wargames table, the 1805-07 project continues unabated. I have just managed to finish off a battalion of the Fangoria Regiment which fought in Langeron's Column at Austerlitz on that fateful day in December 1805.
command bases with the mounted Colonel just slightly ahead, leading the column on the base as shown. 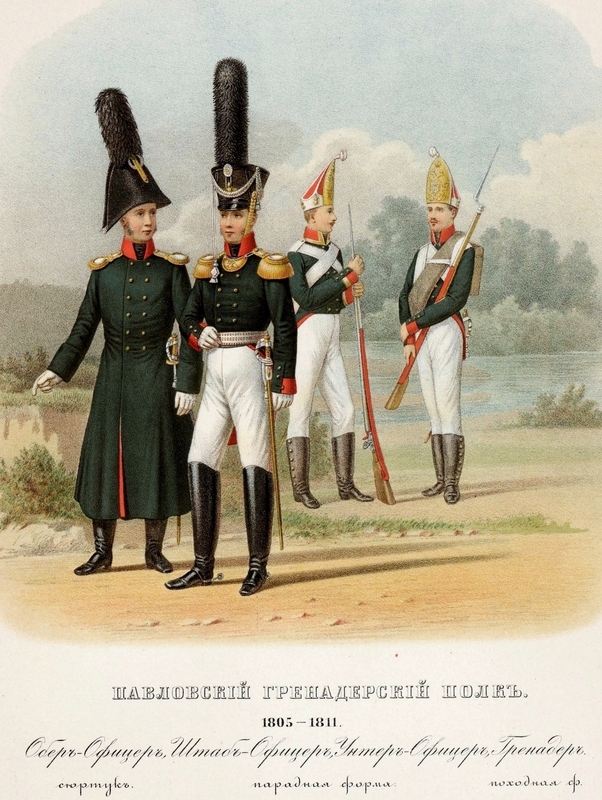 The Fangoria Regiment consisted of two fusilier and one grenadier battalions and had a crisp and clean white facing to the uniform which shows up very well on the darker green coats of the Russian army. Though the fusilier mitre, which was shorter than the traditional grenadier one, was meant to be phased out in late 1804 their are sources stating that it was still in use by some regiments up until 1807. Since Elite Miniatures and Peter Moreby make these wonderful figures in mitres it seemed a shame to not include them in the force. 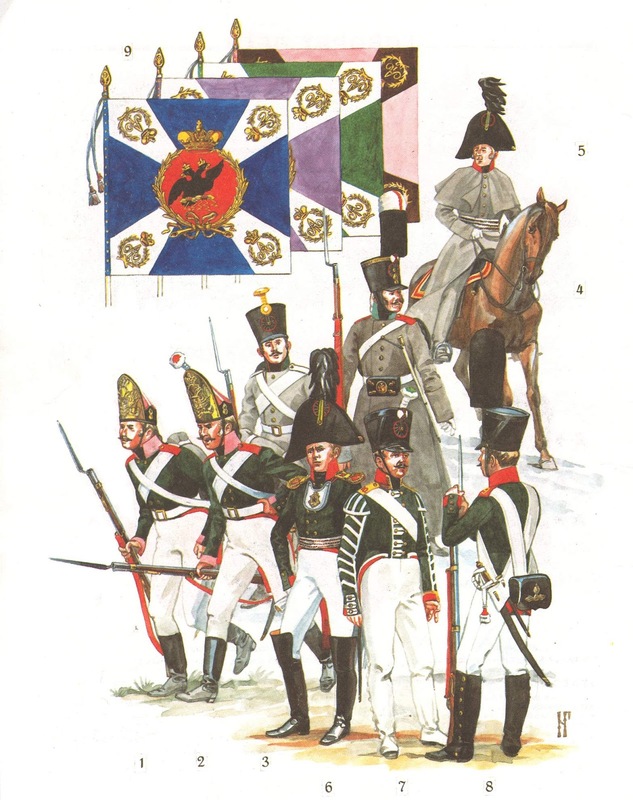 They will also appear on the field of battle alongside troops in the newly introduced shako (not the sloped Kiwer of 1812 fame but an earlier version) as well as some regiments still in bicorne as was indeed the case during this early period of the campaign. Another view of the battalion as well as my very messy paint rack! period. You can clearly see the difference between the fusilier and grenadier mitre cap. Another great depiction of headgear. I especially like the Officers green overcoat. Beautiful hand made and painted flags from that dapper artisan Mr Mark Allen. These will be joined by a second battalion which I have just undercoated and hope to have finished by the Easter weekend. I am still deciding whether the Grenadier battalion will be in the old style mitre or in the shako and am leaning towards the latter. Lets see what the next few weeks leads to. and equipment...well a few good coats of paint at least! Very nice work there Carlos. You have been busy of late. Thanks Pete - have caught the wargaming fever again and need to make hay while the sun shines before it breaks! Thankyou Serguiss very much greatly appreciated. Great looking Russians, blink and you've knocked out loads of figures, very nice! Thanks Kerry. Just starting to finish off a few projects that have been on the go for a while. I can’t figure out how the commander is based, does the command stand have a piece that juts out? Hi Stew. Thanks for the kind words mate. The commander sits on a small "finger" of mdf that is specially cut out so he appears to be leading the battalion. It is a throw back to the old Peter Gilder Wargames Holiday Centre images I used to see in all the UK Magazines as a boy. I only use this for certain projects such as Elite Miniatures 1805-07 and Peninsular collections. I Dremel the piece of craft wood and then simply use PVA white glue on the horse to sit half way across the base and the finger. Cheers Stew - it’s a different look for sure and has its storage challenges but I do like the look on the table for these particular figures and period. I’ll be doing the same with my Elite Peninsular collection. Great looking unit, Carlo. I much prefer the look of these earlier Russians to the 1812 ones, but alas they were not variable way back when, so my own Russians are decidedly of the 1812 variety! Thank you Peter. The variety is very good in this patios and the combs on the cavalry helmets are superb. It was one of many things which impressed me about Sergei Bondarchuks 1968 “War and Peace” in that the Austerlitz scenery were all in the old style uniform and then the Borodino battles were in the newer kiwers etc. Great attention to detail. great looking unit Carlo. Early Russians are among my favourites as are Elite miniatures even though mine are all French, Prussian and Saxon. I'd go for mitres for the grenadiers. Thank you Colin. I couldn’t agree more on the quality and the massed aesthetic effect that Elite Miniatures bring to a wargame. Looks your collection by the way. "Fangoria" has always seemed an odd name to the ignorant & uneducated me. The name sounds like it should be used in some fantasy ... elves and dwarves fantasy! ... book. “Apart from their first battle”- that’s gold Von Peter! Thanks Mattyand best of new year wishes mate! "He who hesitates is lost!"